I discovered via Adventures with Kids that today is A.A.Milne's birthday. Milne is an author I have loved since I was a child. I remember finding Winnie-the-Pooh at my cousin's house, and grabbing it because I thought it must be a rude book. Well, it wasn't rude, but it totally charmed me and I inhaled it the way kids do when they love to read. Are you a Tigger or an Eyore? Truthfully, Eeyore used to bother me. I wanted him to have some oomph and look on the bright side for a change. My friends and dear ones tell me I am a Tigger; bouncing around, and rushing headlong from one joyous experience to another. It may also explain why I am currently hobbling about with a cracked rib! Do you have a favourite Milne character? Or a marvellous Milne moment? If you don't know the books, I encourage you to seek them out to share with your children. To celebrate the birth of this favourite Book Chook poet and author, I created a quiz for other Milnophiles. If you/your kids would like to play, leave any answers you want in comments. 1. Who had a battleaxe with great big knobs on? 2. Why did Pooh want Christopher Robin to give him a balloon? 3. Pooh was a bear of very little ____? 4. Who discovered the North Pole? 5. What little something did Pooh like to revive himself with? 6. Who had ten pink toes, two blue eyes and one red head? 7. What happens if you teazle a sneezle or wheezle? 8. What did King John want for Christmas? 9. What did Piglet give Eeyore for his birthday? 10. Who used Pooh's legs as a clothes line? You'll find other ways to celebrate at the Penguin site in their Pooh Party pdf. Thanks to Kat at Adventures with Kids for finding it! Here is a website proclaiming itself as the largest Pooh community on the net. Disney have a Winnie the Pooh movie coming out in July 2011, and the trailer is below. As for me, I'm off to celebrate Milne's birthday by listening to Melanie singing Alexander Beetle. My favorite childhood book was The House at Pooh Corner, and it's the book that made me know I wanted to write children's books! I am neither Tigger nor Eyore - I identify most with Piglet! Tiddly Pom! In 8th grade, a bunch of us took the nicknames of characters in Winnie the Pooh. I was "Rabbit," which, ironically is my Chinese birth year (didn't know that in 8th grade). My favorite story/song is The Blustery Day. PS - You've also reminded me that i need to get out that box of 50 different Poohs that Miss C has. Everything from Arbor Day to Sweater Day. Hey there, Rabbit! With all those friends and relations, you'll never be lonely. It's almost time for Year of the Rabbit - I have a post coming up for Chinese New year, too. Oh I hope you get the 50 different Poohs out and post about them! I would love to see them. 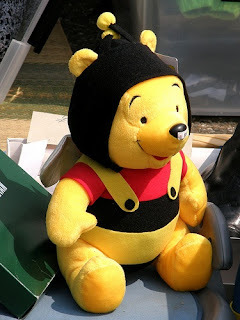 I had to search hard for an image for this post and loved Pooh as a bee, above. I'm a Tigger too! One of my favorites as well- did you see new movie coming out? It looks charming like the original characters. Of course you're a Tigger, although you have enough energy to out-bounce him! I liked the look of the trailer but I don't think the movie is out in Australia yet. I'll let you know! Oh, what a wonderful find! I love that kids absorb so much interesting language, rhyme and rhythm, and delight in words that way. I can hear an actor's voice in my head reciting, "Have you been a good girl, Jane, have you been a good girl?" So I must have listened to some Milne over and over at some stage. I was so busy today, I almost forgot, but thanks to your reminder all is recovered and we have read Pooh, played with balloons and eaten honey. Disobedience is one of my favourite poems too. Sounds like a perfect celebration! Sing ho for the life of a bear! Happy Birthday to A.A Milne. The loveable characters he created have been adored by many generations. That funny old bear! Pooh is my favourite too. I've been collecting Pooh bears for years. I've bought them for my own children but I think they're really for me! My favourite scene is when Pooh visits Rabbit for lunch and eats so much honey that he becomes very stuck in Rabbit's Hole. Rabbit is not impressed. Thanks so much for the reminder of A.A. Milne's birthday! What a fun post. I used to love his poetry, too--I read and re-read those so many times as a child, and have wonderful memories of my mother reading them aloud to me, too. P.S. I should also say, Hipy papy bthuthda! Hi Pooh Bear! I love that scene too, and the indignity of having washing hung on his legs. I don't know the Logins song - thanks for mentioning it! :-D Maybe we need neuroses to be endearing? I know a lot of the characters I love in literature are so beautifully and fascinatingly flawed! I think having the poems read aloud to us, either via CD or a loving parent or teacher, is such a great way to absorb all the nuances of language play. So clever of your mother, Sarah.